Posted on July 20th, 2016 by Lorna Parsons and filed under BPN News, Community, Events, Office. 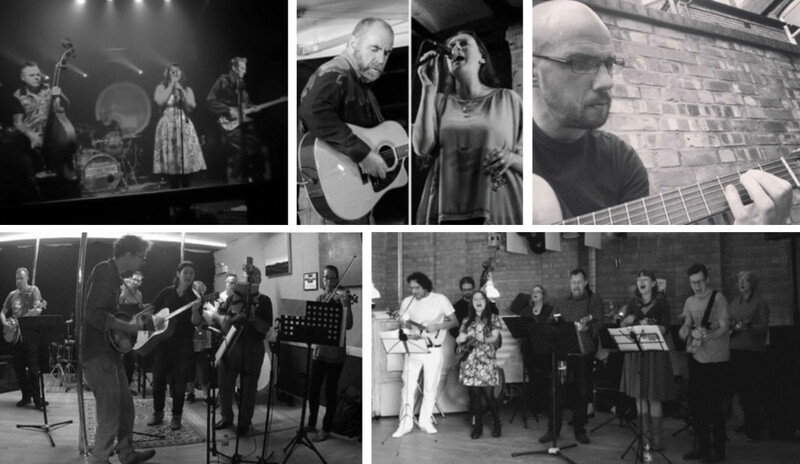 Moselele: “The second best ukulele group in Birmingham” will be performing some new covers, as well as some of their old favourites. Join us as we laugh at their tiny little guitars, and marvel at their bizarre song choices. Dark Circus: Formed in 2014, the band brought together a broad spectrum of styles and backgrounds and mixed them up to create something with a dark and different vibe. Dark Circus describe themselves as “Neo rockabilly goes gothic” and their debut album Lipstick Party Killer is out now on Western Star records. Alan Morrissey: Architect by day, guitar player and composer by night, Alan will be entertaining us with a mixture of instrumental covers and some of his own original songs. We Ain’t From Alabama are a bluegrass band from Birmingham (this Birmingham, not the other one). A group of Brummie friends, looking for an excuse to play those guitars, banjos, mandolins, fiddles and double basses that they’d bought on a whim. They’ll be playing a mixture of old-time standards and contemporary covers in a bluegrass style. Ashland: We’re really pleased that Ashland said they would come back and perform for us again after taking part in our 2015 event. They are an accomplished acoustic duo based in the Midlands with Kathryn Marsh on vocals and David Sutherland on guitar.